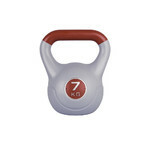 The Dumbbell inSPORTLine Vin-Bell 5kg is a high quality, bell-shaped dumbbell with a triangular handle. Made of high quality plastic, this dumbbell is filled with cement. The solid handle allows for a safe and comfortable workout while the rubber pads on the bottom provide stability when you put the dumbbell on the floor. 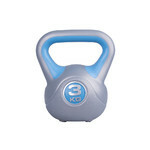 Suitable for all age/performance groups, the Dumbbell inSPORTLine Vin-Bell 5kg is perfect for developing dynamic power.